There are 80 million Mac users. The last 12 months saw sales of 18 million Macs. 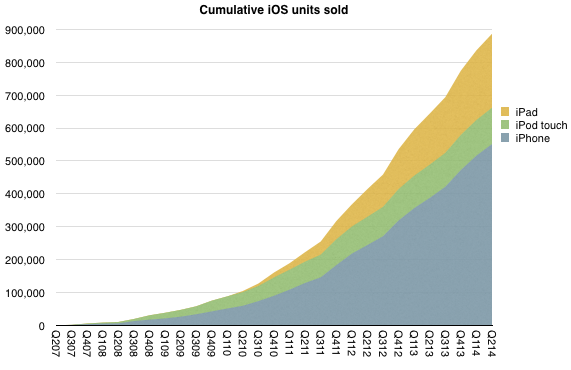 As of the end of June there were 886,580,000 iOS devices sold. As of today the total is well over 900 million. One billion sold will happen well before this year is out. Estimates of current iOS users vary but they are probably at least 500 million and could be 600 million. Apple claims 800 million iTunes accounts. 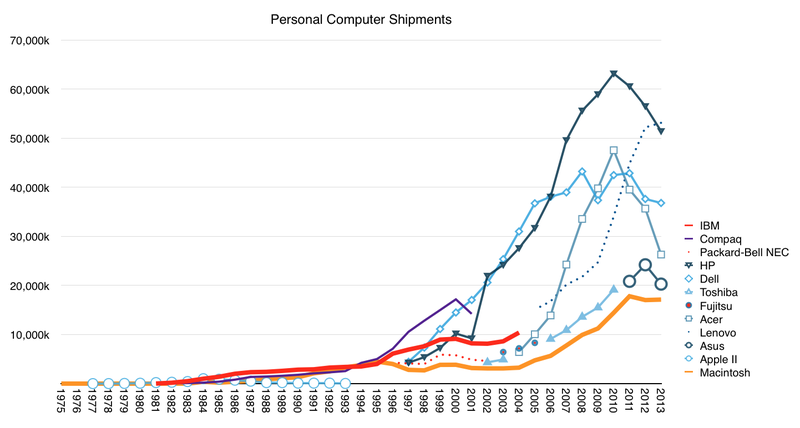 So as far as the Mac is concerned the slowing of the decline in PC unit shipments isn’t at its expense. IBM did not invent personal computing but their “PC” became synonymous with the category. Having entered the market in 1981, the IBM PC quickly became the top selling brand. From 1984 to 1993 IBM sold more PCs than any other vendor, conceding the spot to Compaq which remained on top only until 2000. No PC vendor remained at the top of the sales leagues longer than IBM. HP had the second longest run but that run was broken last year as Lenovo (who acquired IBM’s PC business) surged. As the graph above shows, the period of time when IBM was dominant was characterized by far lower volumes. In 2004, the year IBM exited, they sold about 10 million units. ((as the graph shows, if we consider Lenovo as taking over from there, they did a very good job extending the legacy.)) It was a decent performance but one that did not keep up with the Dell and HP/Compaq race to the bottom in pricing and subsequent rise in volumes. However, throughout its position of strength, IBM was a reluctant PC maker. Horace Dediu joins us for the 22nd episode of “The Innovation Engine” podcast to discuss innovation and the future of mobile – what the post-mobile world will look like; how Apple, Google, and others are shaping the mobile experience of the future; and the next frontiers of mobile after health and fitness. In this episode of the podcast, Horace talks about why mobile and smartphones will no longer be thought of as synonymous in the very near future. He discusses how soon-to-be released products like Apple’s HealthKit and Google Fit, combined with the revolution in wearables, will continue to drive change in industries like health care and will put more power than ever in consumers’ hands. Horace also shares his thoughts on “The Disruption Machine,” Jill Lepore’s New Yorker article that criticizes Clayton Christensen’s theory of disruptive innovation. While he believes there is some merit to the notion that disruption is overused, Horace says the article overlooks years of research and writing since that has helped refine Chrinstensen’s theories. 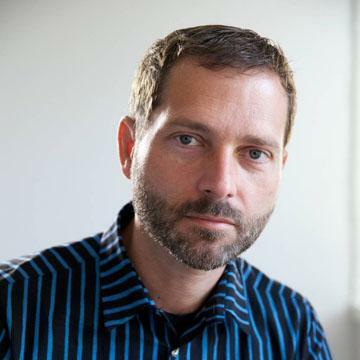 He wrote a post for the Asymco site titled The Disruption FAQ in response to the article if you are interested in reading more of his thoughts on the matter. via Innovation and the Future of Mobile, with Horace Dediu. We reflect on why the narrative on Apple has changed post-WWDC and analyze both the evolution and consistency of Apple’s culture. Furthermore, what elements of that culture/process/priority setting can be copied? In other words, what does it take to be great? via 5by5 | The Critical Path #118: The Cook Doctrine. Dash is a website that lets people quickly make real-time dashboards. They have an API that allows you to share data from Dropbox or the web with custom widgets like Charts, Speedometers, and Tables. Dash also has dozens of pre-built widgets for services like Google Analytics, appFigures, GitHub, Google News, and many more. 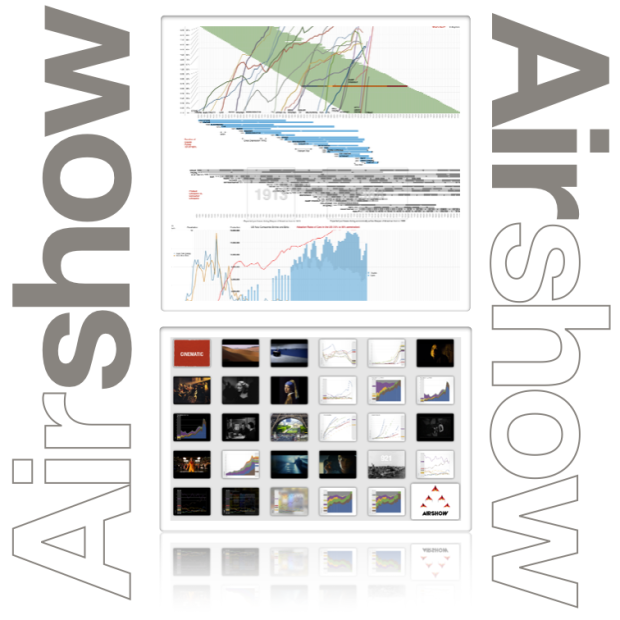 If you make your dashboards available to the public, Dash is completely free. If you don’t want to share your data, you can also build private dashboards. Free accounts come with one private dashboard. Pro accounts are $10 per month and have unlimited private dashboards. 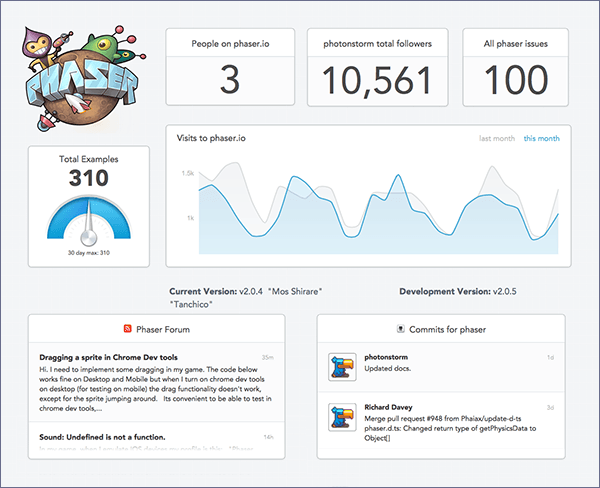 This month’s featured dashboard is Phaser. It’s a dashboard that shows the latest data from the popular HTML5 Game Framework including forums posts, active users, and recent GitHub commits. Seven years after the iPhone was launched, 70% of the US population is using smartphones. Smartphones existed before the iPhone so the category is older than seven years but as far as adoption goes this is nearly the fastest ever. The CD Player reached 55% in seven years and the Boom Box about 62%. 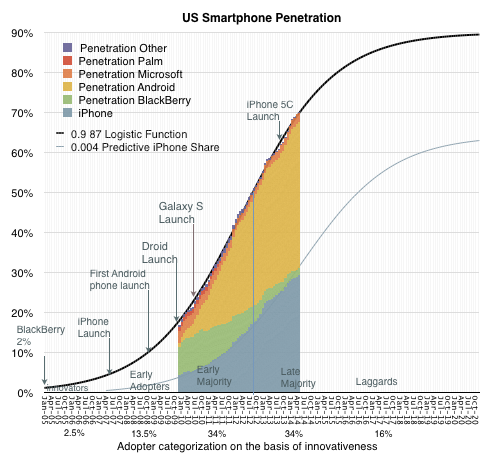 If measuring the period between 9% penetration and 90%1 the smartphone in the US will have a lifespan of about 9 years starting in 2008. Before this period, the product was largely experimental and participating vendors2 mostly failed. After this period most products will be “commoditized” with decreasing margins and increasing consolidation. We are therefore now in the “Late Majority” phase of the US market. This is not a surprise. The inflection point in the market occurred in mid 2012 so we’ve been in this phase for two years already. It’s not therefore controversial to predict two years of continuing though decelerating growth. One aspect of this adoption cycle that is misunderstood is the role of pricing. The assumption is that pricing matters more as adoption increases. This is misunderstood because pricing always matters and therefore it never matters. Pricing is one of many elements of marketing mix and at any time there are product choices across a wide spectrum of pricing. Pricing is also a signal which can be elaborately obfuscated through bundling and unbundling. One way to illustrate this is to consider how Apple products behave in the late phases of markets. Apple products have notoriously firm pricing. 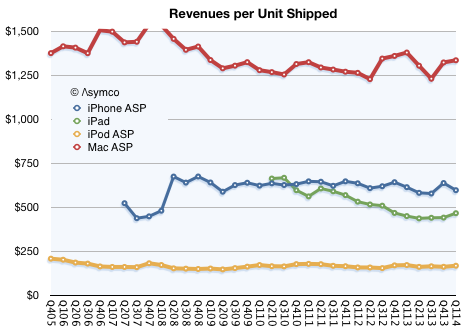 The revenue per unit of Macs, iPods, iPhones and iPads remains stubbornly consistent. This is not to say that each unit sold is the same price. The company tweaks “the mix” of mid, low and high products to keep the average selling price constant. But fundamentally the average remains constant which means that regardless of market phase, Apple retains its margins. So as we look forward to the last two years of growth for smartphones, how will Apple fare? The same phenomenon was experienced by fixed component “Hi-Fi” audio products. The quality of mobile music was poor but it was convenient and convenience translated into consumption and consumption translated into quality improvement and eventually the evaporation of usage of the traditional category. Now consider how ad dollars are getting spent. 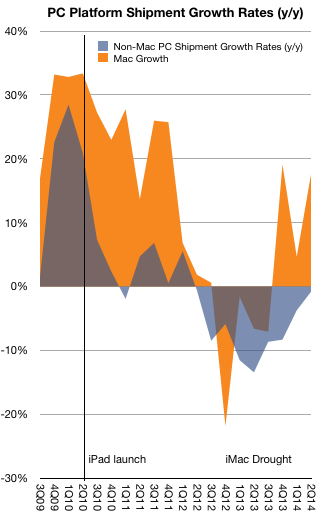 The following chart shows the eMarketer forecast for ad spending mix across different media in the US. 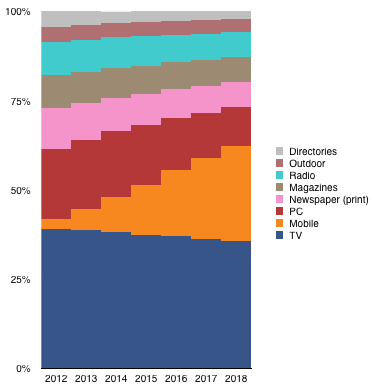 It would appear that the “Mobile” media is competing effectively against the other media types, especially the non-Mobile digital (i.e. PC-based experiences). However, if we look at the absolute spending forecast the picture shows that Mobile is responsible for most of the growth in the overall spending.